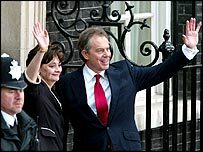 Tony Blair's supporters brush off calls for him to quit as he puts the finishing touches to his third term ministerial team. Nicholas Soames and Tim Yeo quit the Tory front bench saying they want to help reshape the party's future. As he speaks about stepping down as UUP leader, David Trimble says the electorate voted for stalemate. What's your reaction to Labour's third term?